Let the way be Open. It began with banter and repartee between two student working in the cafe in my building at work. “Nobody likes the sound of your voice,” she said, “so you should just not use it.” We laughed uproariously as the young man responded and the two of them continued their playfully hostile banter. I posted this in my status on Facebook as “overheard in the library.” It shows why context is so important. A couple of people reacted to the hostility and not the humor of the remark. O one person said that when she was a child that her singing was an offense to God and she should stop singing aloud, and she carried that remark and prohibition forward to adulthood. My jaw dropped and my angry fingers typed. From my Baptist background, my reaction was a very sarcastic “nice witness,” and currently would have added a well placed expletive as well. It reminded me that I have my own journey with that kind of silencing. When I was younger, I sang all the time and was in the school choir. My voice was relatively untrained but I still sang all the time and sang along with the radio, albums, and the television. I sang myself to sleep, I sang in the shower, I sang in the car…everyplace was a good place for song. Some where in the midst of a couple of difficult relationships, I silenced myself. When I moved to rural New York, I got sick a lot. It was part allergies and part stress related colds and flu. I coughed a lot, sometimes for months on end. All of this roughened my voice and made it crack. Still I sang–coughed and sang. One evening, I was sitting at a table of amateur singers who said they’d like to form a choir of singers to sing pagan chants and songs at our gatherings. “I’d like to be a part of that,” I said. The deafening silence as all the women looked at each other told me all I needed to know: they don’t think I’m good or good enough. I shut up about that. At the same time, I was in a relationship with a man who didn’t like a lot of distractions including noise. He’d turn down the television or the stereo. He didn’t even like the sound of the refrigerator, washing machine, or dryer running. He didn’t like hair dryers. My life became quieter. And then too, the radio in my car stopped working so I couldn’t play music and sing along. I couldn’t afford to get it fixed for a long time and then when I did, it stopped working immediately. The good news was that I became very comfortable with silence and didn’t need extraneous sounds and noises to distract me or entertain me. The bad news was that I forgot how to sing and learned that I was a bad singer. I became embarrassed by my singing voice. I forgot the words to songs and I forgot to sing. As time moved on, so did the friends and relationships; what remained was the silence and the silencing. My practice as a witch and shamanic practitioner deepened and I became a High Priestess and leader in my community. I was reading a well respected teacher on an email list who said that shamans and shamanic practitioners “gave voice” to their magic. 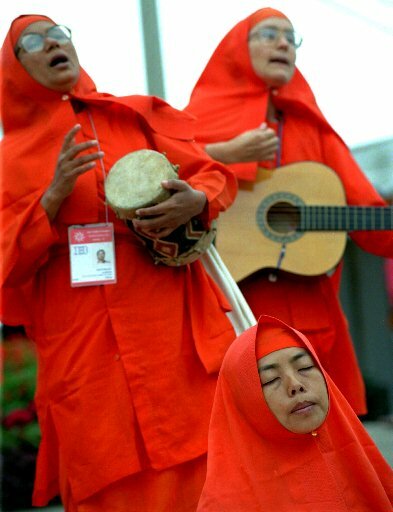 With their voices, raised in song, they led their communities and themselves to greater healing and soul discovery. That challenged me to confront the silencing. I re-retrieved my power song and began to sing again. Over the past few years, I’ve actively practiced ‘giving voice’ to the songs within. Our group sings alot and we have some wonderful Enchantresses in our midst. They help me to have the courage to remember and to give voice. My voice has gotten stronger and my memory has gotten better. It’s all in process and it’s all beautiful. One person who responded to the Facebook thread says she makes a joyful noise using the voice the Creator gave her. And as another one said, if they don’t want to hear it, they don’t have to listen! One of the things I’ve learned from this silencing and self-censorship, is that you don’t have to stay silent. We are resonant beings and can give voice to our power and our songs. Music fills our souls and its energy wants to go out into the world. Our histories and our culture often tries to inhibit that energy, so it takes courage to give voice. Once you do give voice to your soul and your heart, you find out how much freedom you have. The gods wish us to sing every note so may you find your voice and give it to the world, loud and proud!